I don’t know what goes on at night but THIS is how all of my children look when they wake up. I swear on everything that is holy and good that I did not alter this boy’s hair in any shape or form for this shot. THIS IS HOW I FOUND HIM. And this is how I find him on a regular basis. What’s worse? Finding my daughter looking the same exact way. Except there’s a slight problem. She has as much hair on her head as I do. And after a night of tossing around, it’s all just a rat’s nest. I’ve tried everything! Braids. Ponytails. Side bun. You name it and it’s happened. But it just doesn’t work. Thankfully, Liam has SUPER SHORT hair – so one out of three ain’t bad. 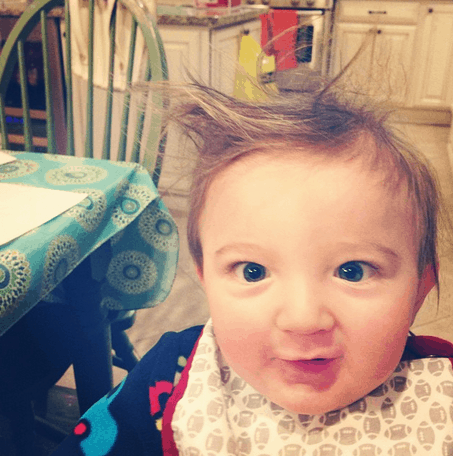 What a cutie pie, even with violent bed head! Sounds like my three girls. Except I can HEAR how my oldest girl sleeps. She’s in her room karate-chopping the walls in her sleep. Kind of scary if it’s your first time as a guest in our house.